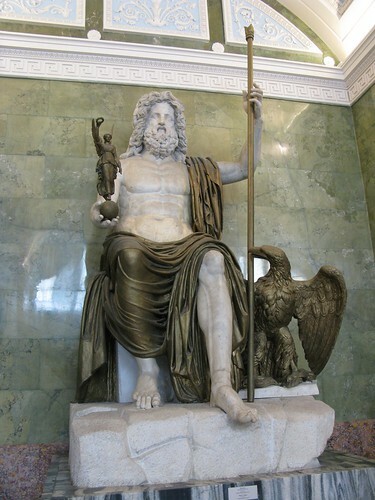 There are many Greek and Roman Gods, and one of the Greek Gods is Jupiter/Zeus. According to the Roman myths, he was the god of sky and thunder. His skill (identifying implement) was thunderbolt. His dad was Saturn and he had two brothers and three sisters including Neptune/Poseidon and Pluto/Hades. They divided the world between themselves, and Jupiter took all of the heavens, Neptune took the sea, and Pluto took the underworld. Jupiter had more powers than anyone. He could throw his voice, and make it sound like anybody and also he could change shape and look like anybody. He was very good at changing his shape that he could change into the form of an animal. Also, he could throw lightning bolts and his flying horse, Pegasus carried them for him. He wasn’t afraid of anything except for his wife, Juno. 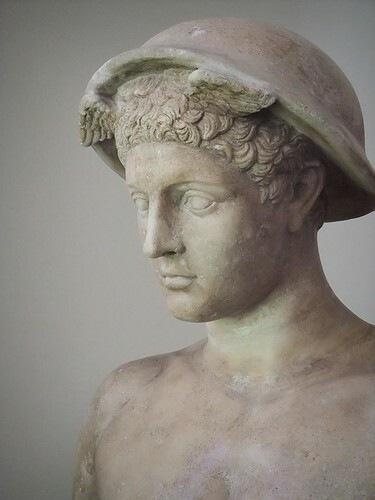 Another of the Roman Gods, is Mercury/Hermes. He was the youngest son of Jupiter and Juno. Jupiter liked him so much. Mercury was very clever and was able to solve problems in unexpected situations, so Jupiter wanted him to have an important job in the world. So Mercury got to be the god of finance, commerce, travel, communication, and thievery. Also, he was the guide of the souls in the underworld.